A rather frustrating listen this one! I think you’ll agree that frustrating is not a word that you would normally attribute to an album that features the production talents of Frédéric Slama (the man behind the successful AOR project) nor indeed to the song writing, arranging and guitar playing abilities of that hard working Swede Tommy Denander. My frustrations are not aimed at these two gentlemen or, for that matter, at any of the numerous guests who lend their considerable weight and talents to this release. 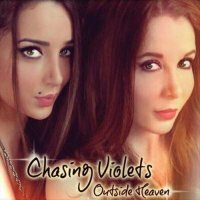 No it sits squarely on the shoulders of the French singer/songwriter sisters Sarah and Mélissa Fontaine, who are, in effect Chasing Violets. Don’t get me wrong, ‘Outside Heaven’ is full of shimmering West Coast influenced AOR tunes that have been arranged by Slama and Denander with some assistance from Paul Sabu and Eden’s Curse keyboardist (and producer in his own right) Alessandro Del Vecchio. So far, so good right? If you then add spirited guitar work and uniformly excellent lead breaks courtesy of Denander and others, sparkling keyboards and a punchy rhythm section you’re now beginning to think what’s not to like about this debut release. It all comes down to the vocals and lyrics, which is unfortunately where the whole thing begins to unravel. Although the girls possess very listenable voices and the choruses are eminently hummable, so much so that my kids were happily singing along to a lot of them in the back of the car, it’s just that the Fontaine sister’s vocals are devoid of any real Gaelic passion. Instead of attacking the songs with gusto, their vocal harmonies just float harmlessly and somewhat aimlessly over what are some pretty good AOR tunes, making the end result well....very ordinary indeed. The use of male vocalists on some of the choruses and bridges, who include amongst their number the vastly experienced Göran Edman, only serve to expose their vocal limitations even further. Some clunky lyrics and rather clumsy vocal melodies just add to their woes. It’s not all bad; ‘Outside Heaven’ itself and ‘Just Wanna Be Your Herion’ show some promise where the choruses are a bit more rousing and powerful but two out of thirteen isn’t a great batting average in anyone’s book. With better lyrics and vocals this could have been sooo much more. Instead this is a very ordinary AOR album, which is not only frustrating but a real shame as well!